The semiconductor revolution of the twentieth century gave rise to the microprocessor, spawning a fantastic array of now-familiar electrical devices. As scientists continue to learn more about the physical properties and behavior of semiconductors, we may be on the cusp of a second semiconductor revolution, developing novel materials that will enable a new wave of improved technologies. Semiconductors are materials with properties intermediate between highly conductive metals, in which free electrons move easily, and non-conducting insulators, in which electrons are tightly bound. The non-conducting electrons in semiconductors occupy a continuum of energy states called the valence band, and they require additional energy to enter the conduction band. Semiconducting materials are classified according to the amount of extra energy a valence electron needs to become conductive in the material. We determine this by observing the energy transitions that occur when light excites the electrons from their ground state to an excited state. When electrons in a semiconductor acquire enough energy to enter the conduction band, the “missing” electrons in the valence band are referred to as holes. Holes can move through the material in the same way an empty seat in an almost-full row of chairs moves as people shift, one at a time, down the row to fill the empty seat. 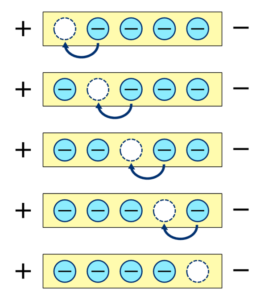 Similarly, as valence electrons in a semiconductor move to fill a hole, the hole moves in the opposite direction, as shown in Fig 1. 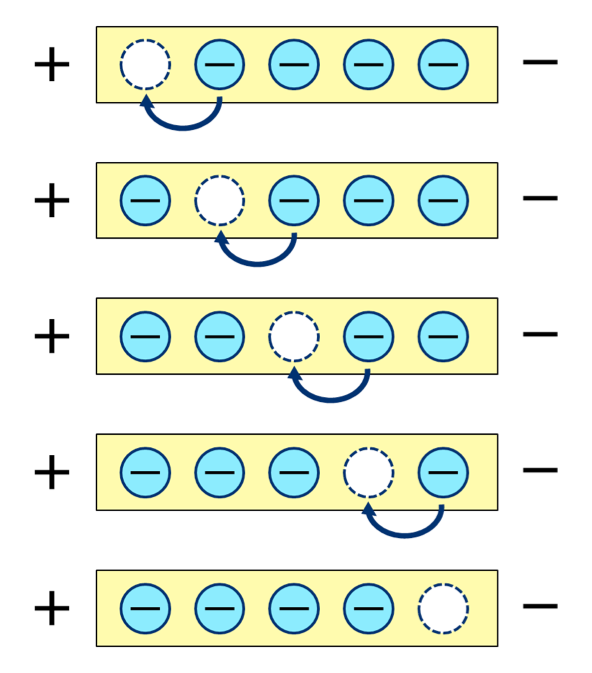 Two of the energy states within the valence band are referred to as the light-hole band and the heavy-hole band; when the electrons occupying these bands become conductive, the remaining holes are light and heavy, respectively. It may seem strange to describe a hole, the absence of an electron, as “heavy” or “light”—by analogy to matter, we can think of the effective mass of a hole as a measure of how much force is required to move it. The light-hole band is notoriously difficult to study, however, because the light-hole and heavy-hole bands are nearly identical in energy. This means that, using traditional optical techniques, the dominant signal of the heavy-hole band tends to obscure the light-hole band (see Fig. 2). A team at Washington University in St. Louis led by Prof. Sophia Hayes uses an exotic technique known as optically pumped nuclear magnetic resonance (OPNMR), taking advantage of the communication between electrons and nuclei in semiconducting materials to clearly observe transitions from the light-hole band. We begin by using lasers of different colors to excite the electrons in the material at various energies, creating heavy holes in some instances and light holes in others. The conductive electrons have different orientations, depending on whether they originated in the heavy-hole band or the light-hole band, and this affects the nuclei around them. The conduction electrons that originated from the light-hole band cause the nuclear resonance signal from the nuclei to invert, as shown in Fig. 3. This technique allows for the easy identification and observation of the light-hole energies, and the results we obtain give us new insight into how the band structure of a semiconductor affects its behavior. This, in turn, will enable us to develop semiconductors with desirable properties, which can be used to improve the many electronic devices—like the one you’re using to read this right now—that rely on semiconductor technology. Fig. 2 (Click to enlarge) Fig. 2 The gray lines mark the energies of the light holes in the bulk semiconductor gallium arsenide (GaAs). 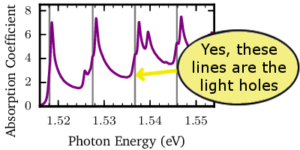 As you can see, the signal from these electron transitions is faint when we use traditional optical methods. Fig. 3 (Click to enlarge) Fig. 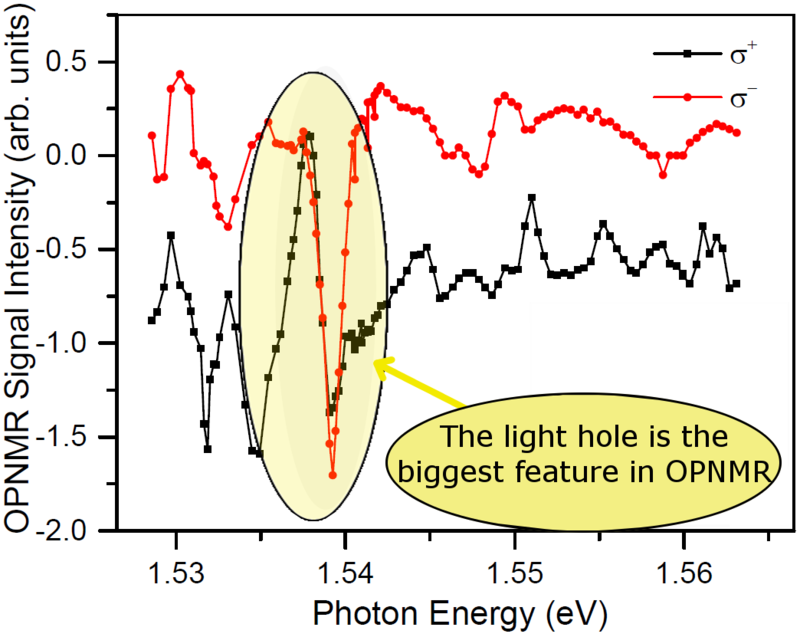 3 The black and red lines show the OPNMR signal intensity obtained using laser light that has been polarized in the clockwise and counterclockwise directions. 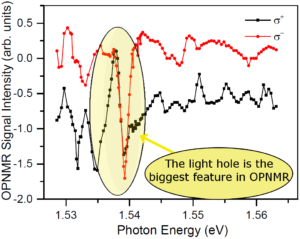 For both plots, note that the biggest feature we see is at the position of the light hole, where the OPNMR signal reverses direction.